For your convenience, we’ve assembled the most popular and often-asked questions. If you don’t see your question answered here, send us an e-mail or call us directly at (828) 686-3885. We’d be delighted to hear from you. How many campers are in a cabin? 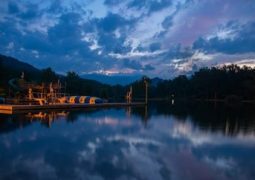 Our younger campers (ages 6-10) will have 8-12 boys per cabin and our older campers (ages 11-16) will have 8-9 campers per cabin. What is the camper/counselor ratio? For our youngest campers, there are typically 8 campers to 2 counselors. For our older campers, there are generally 8 campers to 1 counselor. Our overall camper:staff ratio is 4 to 1. How many campers are at your camp? Our camp capacity is 400 campers. However, campers do not experience camp on that level except when we are in the dining hall together during meals. 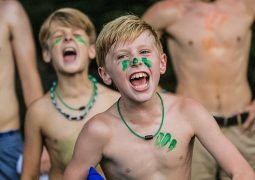 Campers experience camp with their tribe which can be 55-70 campers (depending on the age group). They experience Skills in more like a classroom setting of 10-20 (depending on the skill) and the Cabin is more of a home like setting. What ages are at your camp? Our campers are age 6-16. The six year old campers are eligible to attend our Starter Camp. Starting at age 7, campers can attend our two week sessions. At age 11, campers have the choice between the two-week sessions, our unique three-week session or our four-week session. How do we put campers in cabins? We place campers with peers of a similar age based on the grade the camper is currently in. We can almost always honor at least one cabin request so long as it is mutual and the boys are of a similar age and grade. My child has never been away from home before. How do you deal with homesickness? Homesickness is part of what we do. It is a wonderful opportunity for a camper to grow. We validate their response as something completely natural and normal, and then give the camper coping mechanisms to help them learn and become stronger as an individual. Read our blog post about homesickness. Can I call or come visit my son while he is at camp? While your son is at camp, he is making new friends, learning new skills and having the time of his life. 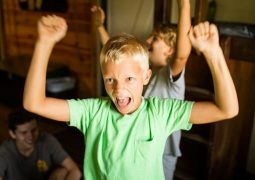 We have found that a call from a parent disrupts the natural flow of the schedule for a camper and produces more homesickness. The same applies to visiting during his camp session. But campers LOVE mail so write letters often! There is also a one-way email system that can be used to send an email to your camper each day. Can my son bring his video game or Kindle to camp for his summer reading? Your camper is entering an electronic free zone. By unplugging from all the normal distractions of life a camper can become fully engaged with the people around him and more self-aware, creating a whole new level of healthy growth. If he has summer reading, a good old fashioned book from the library is the way to go. 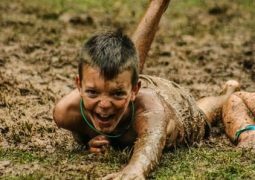 What activities will my son do while he is at camp? We offer over 35 different skills for your camper to choose from. Anything from Archery, Rock Climbing, Kayaking, Guitar, Crafts, Homesteading to Blacksmithing (for campers age 13 and up). The possibilities for mastery in a new skill are endless. 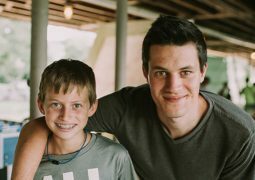 What if my son has a birthday while he is at camp? We celebrate big! Throughout the day a camper with a birthday will be celebrated by his cabin and tribe. At lunch the entire dining hall will sing the traditional birthday song for your son while he blows out the candles on his own cookie cake that he will share with his cabin. My camper is a picky eater. What kind of food do you serve? We have a wide variety of balanced buffets we offer at each meal and encourage our campers to try new things. Breakfast can include eggs, bacon, toast, fruit and cereal. Lunch and dinner may include choices such as chicken fingers, lasagna, baked chicken, mashed potatoes and veggies. There is a fresh fruit and salad bar at lunch and dinner meal times. We also offer a delicious vegetarian buffet for any vegetarian camper. My son has special dietary needs? Our kitchen staff is eager to accommodate dietary needs. A dietary specialist oversees those accommodations. Any food allergies should be discussed in advance to ensure that we can accommodate your son’s needs. 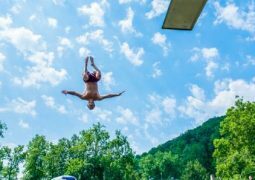 Rockmont adheres to the very highest of health and safety standards for summer camps. Our boys camp has been accredited by the American Camp Association since 1961, confirming that we comply with standards formulated to promote safe and professional practices in all phases of camp operation including the site, health and safety, food service, staff and program. Our Waterfront Director, Jim Hinton trains and manages a robust lifeguard staff that keep a vigilant watch of the campers while swimming and boating. How do you hire staff? We seek staff members who are passionate about youth development, love being outdoors, and who are seeking to grow in faith. In short, we hire staff that we believe to be life-giving. Our staff come from colleges and universities across the US. We also draw staff from other countries, including Mexico, Hungary, and the United Kingdom. Many of our staff started as Rockmont campers who return to camp in their college years to make an impact on the next generation of campers. Others we find through campus ministries like Cru, Fellowship of Christian Athletes, and Reformed University Fellowship. Additionally, our instructional activities are often staffed by local teachers. Our staff go through an application process, are interviewed (by two Directors if applying for a Counselor position! ), have reference checks and background checks completed, and then attend staff training at camp. A $500.00 deposit is required to reserve a spot for your camper. The balance of the camp fee is due by March 1st. Any cancellation made before March 1st will receive a full refund (less a $100 processing fee). After March 1st there is no refund except in the event of illness or injury. In such an event, 50% of the tuition will be refunded or 100% of the tuition (less the $100 processing fee) will be rolled over to the following summer.